My first Romanian editorial that I want to share with you. I have a passion for Chotronette, not only because I feel their dresses are so amazingly representing me, but these girls are full of fabulous ideas and this particular editorial prove my words, don’t you think so? Nice black and white striped leggings, ha? Now, I would love to be a fan of winter and jump all over the snow! The long pearls belt is amazing! Have to try it! 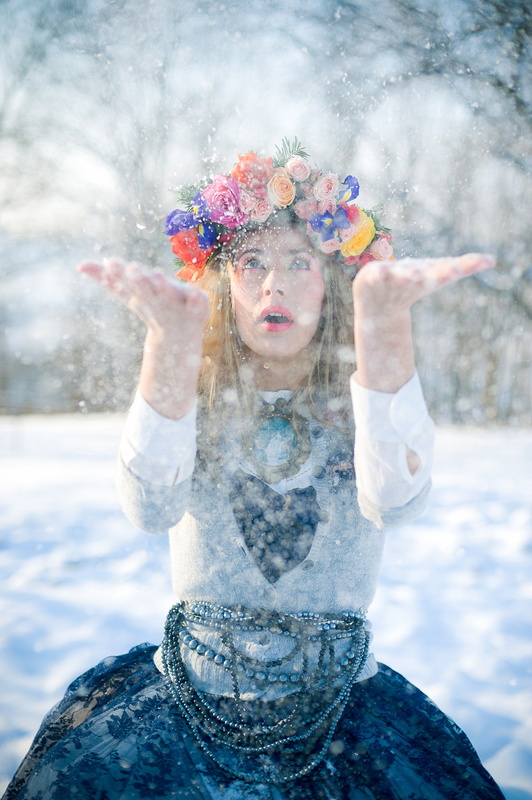 This last one is my favorite: the lace, the pearls belt, the flowers, the electric blue leggings and the cold night! Ok, this is not because I love cold winter nights, I am in love with the summer and the sun (I sometimes think that people love the season when they are born: one of my best friend is born on January and she also has been waiting for the first snow to come while I was trying to explain her that I will be very happy to skip the snow this year!!!) but the photography is so beautiful and I hope I will soon be able to take such fabulous pictures with my new professional camera! I also intend to follow a photography course!